Children and Young People are in a Confidence and Mental Health Crisis. With long wait times from 12 weeks to 12 months (or more! ), they’re not receiving the support they need when they need it through NHS or Charity services. 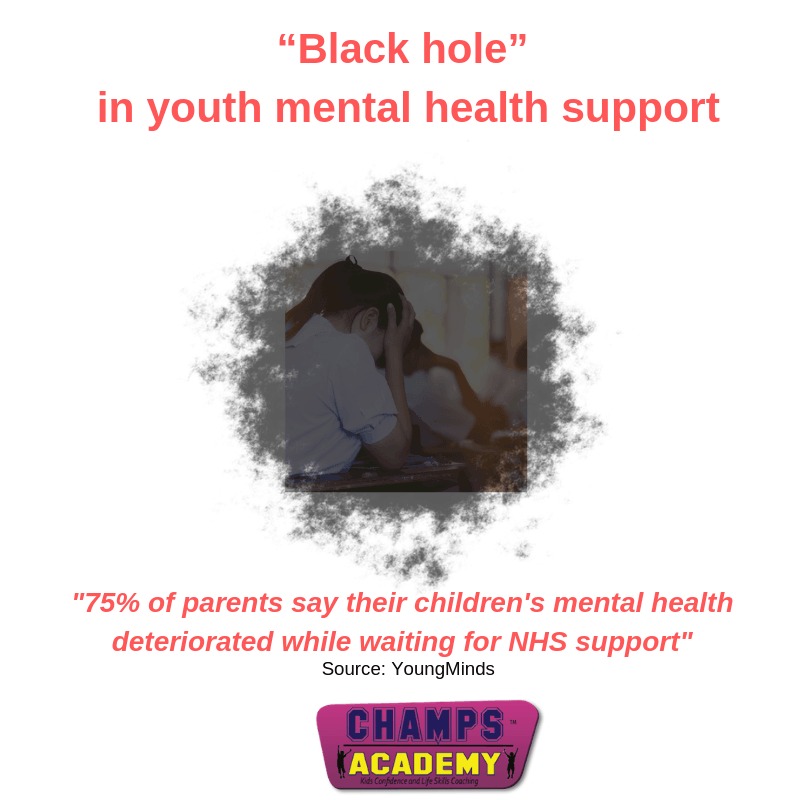 Nationwide CAMHS are over-subscribed, nearly half a million children are waiting for treatment, causing them to turn away a lot of needy young people as well as prioritise to those who are critical. According to the Care Quality Commission, evidence suggests the number of children visiting A&E for mental health treatment has more than doubled since 2010. Many services are failing to meet NHS guidelines for an out-of-hours crisis service. That’s a lot of young people left to suffer unnecessarily and without the proper support quickly becomes desperate, with suicide the only option for them. The tears I shed watching BBC Panorama ~ Kids In Crisis (aired 25/09/18), the Government are playing a deadly game with prioritising where money is spent. This is the future of our country and no-one should ever get to decide who gets help and who becomes a statistic, another devastated family at the brunt of hierarchical decisions. We’re in the 21st century for goodness sake, this sticky plaster, reactive method has to stop now! The Government ‘says’ it is “investing an extra £1.4bn in child mental health services, and “transforming” the service “so that 70,000 more children a year have access to specialist mental health care by 2020-21”. That’s too long to wait, and what about all the other young people left to suffer and become damaged forever when preventative methods can be applied much earlier in the process. Here’s something that’s equally concerning, my local MP covers the Chichester Constituency, and has a keen focus on children’s mental health. Chichester is part of West Sussex, and the Sussex Partnership NHS Foundation Trust was one featured in the Panorama program. My MP has failed to get back to me yet about my concerns and potential solutions I’ve suggested of how I can help young people as well as a solution nationwide! Even my local MP’s office can not provide me with the clear path of where all this money is being spent, or who I can get in touch with to access any of the funding locally or nationally. So Government, where is this money really?! Imagine if 14-year old Jess (featured in the Panorama program) had had the opportunity to learn effective coping mechanisms and strategies to help her in Yr 7 when she first became anxious, what would her life be like now? And for her Mum, Claire, receiving the reassurance and the support that there’s some simple and long-lasting methods her daughter could use in her everyday life to overcome the challenges and feel emotionally balanced to get on with a normal teen life? The traditional methods of helping young people with mind-based issues are often out of date and do not work long-term for the world this generation and beyond are growing up in. Life is much more complex and pressured for young people and original training methods given to School Counsellors or pastoral services do not go far enough to support them anymore. Opting for talking based therapies is not always the best solution and do not provide sufficient and lasting strategies for young people to use in their everyday home/School life to manage emotions, overcome challenges and gain resilience in times of difficulty. Sometimes (and as many parents have commented to me), it gives the problem life and prolongs the suffering. As a registered Mindfulness Teacher with the Mental Health Foundation, Be Mindful site and having coached adults for many years, I can say with experience and evidence that Mindfulness only goes so far. I feel these types of classes offered in School is a weak option to demonstrate the Government are doing something, but it’s not enough. A Mindfulness technique or exercise a child learns in a relaxed, calm classroom environment MUST also be translatable and transferable into their everyday life. Can it actually help them in the playground when they’re being bullied or excluded? Can it actually help them when they feel isolated in their room endlessly scrolling through Social Media seeing everyone else’s ‘perfect’ life? Most of the time not, and there’s the rub! Young people need real-world strategies and techniques that are going to work for them now, and quickly and that relate to the world they’re part of not some traditional service that has been devastatingly proved is not fit for purpose. or feeling unsettled at School. There is a proactive way to help all young people and equip them with confidence, emotional resilience and life skills. We shall see if the Government is willing to accept this simple solution and finally give young people the care, support and resources they need and deserve. Forget every other manifesto in this Country, if we can’t support the next generation and beyond now, the future looks very bleak for them.